Lately I have been stuck in a rut with diet, exercise, relying on mostly standby recipes like veggie burgers, grilled salmon and tuna, pasta, frozen healthy dinners for lunch, etc. There is nothing wrong with any of these foods, I have just gotten a little lazy about cooking new and different foods. I have also hit a plateau in my workouts and I not seeing the progress I am looking for. So I decided to commit to 4 days a week at the gym, no excuses, and to eating vegan for 7 days. 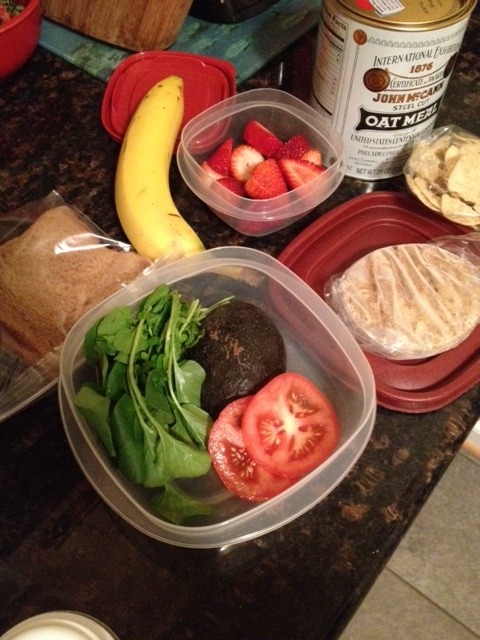 Last night I gathered everything for breakfast, lunch and snacks. Steel cut oatmeal with almond milk and a spoonful of peanut butter and a banana. For lunch a vegan Boca burger (happened to have this in the freezer), watercress, half of an avocado and tomato on whole wheat bread and a few chips. Also a few fresh strawberries from the weekend. Dinner would prove to be a little more challenging. I knew Steve and I could share sides that were vegan, but I would be on my own for a main dish. It turned out Steve had plenty of leftovers from the weekend, so I could try out a new recipe from local Richmond blogger Stephanie, CookinFanatic. I picked up some deliciously spicy Harissa from Cava Mezze Foods at Ellwood Thompson’s, and proceeded to put it on everything over the weekend. 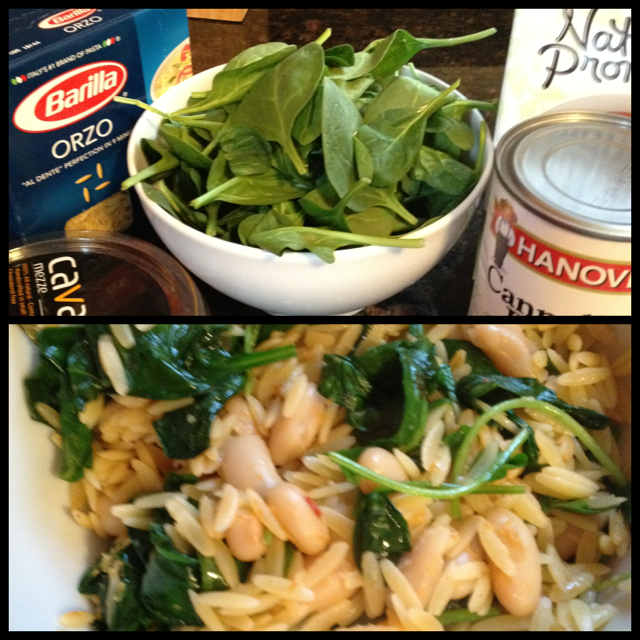 So, for last nights dinner of I modified Stephanie’s recipe and used spinach instead of arugula and cooked the orzo in veggie broth. It turned out really well if I do say so myself. After day 1 I am figuring out that I will be cooking a lot more than normal (not that I mind) and menu planning. Preparing breakfast, lunch and snacks is something I normally do, but usually there is a frozen pre-packaged healthy meal for lunch. Luckily snacks were easy, fruit and almonds, and I am not a sweets person, so dessert wasn’t even a concern. The true challenge will be Thursday when we go out for dinner for Steve’s birthday. Day 1 down, 6 to go.